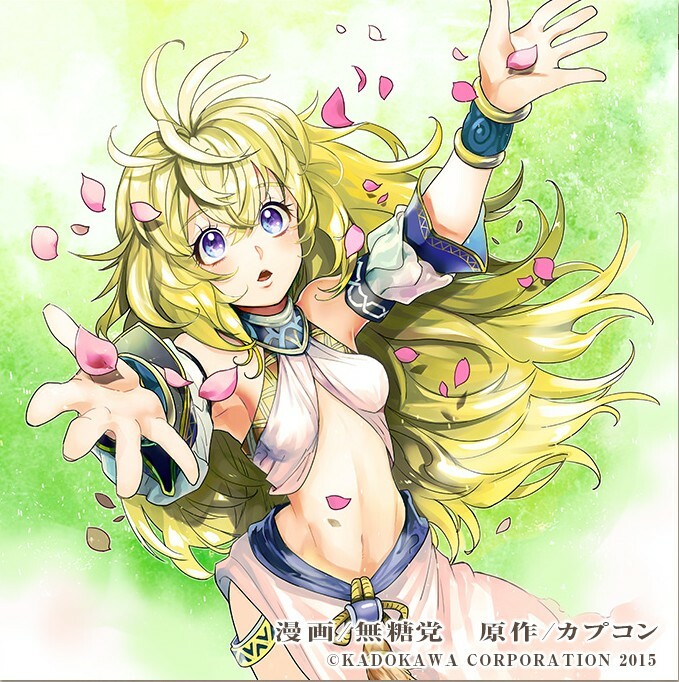 The manga's protagonist is that little cute Algar girl, Agri (アグリ, aguri). She's an old friend of Amelia and an agronomist that has arrived to help her and the villagers rebuild Dragnier. 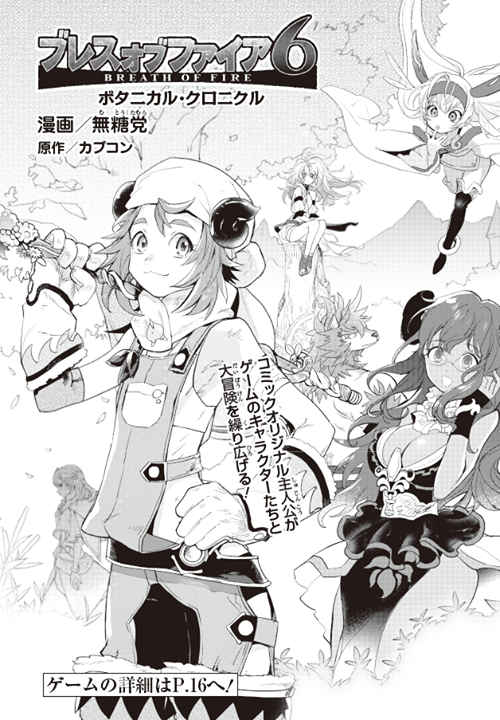 The manga will be published in the magazine Dengeki Maoh (first issue came with the past Sept. 26 issue) and is drawn by Tamura Mutou (seems to be new mangaka, he/she only made two other mangas, one for Kantai Collection and another for Tales of Grace). The magazine will also provide serial codes for items and other benefits for the game in the November and December issues. Unfortunately this one comes out print-only, which means we will need some charitable soul to scan it this time. Also look at that very first panel, its BoF1 Ryu! this pretty much confirms BoF6 takes place in the main timeline. Sounds like an interesting tie-in for one of the new clans people. But I'm not seeing Ryu1 in the first panel, just Peridot who kind of resembles him in that picture. I really like the picture of Nina and I understand that Capcom needs to advertise the new Breath of Fire, but they shouldn't exaggerate. I like, I really do, that they show some extra stories beside the game, but I wish they's have done it with BoF 1-4 (5) as well :/. 'Real' - Canon - Mangas not only the Doujinshis made by BoF Fans :/. See in that first panel at the right? The lad with the long hair, cape, holding a sword over his head, in a style that makes it look like a lore-centric mural or painting, with the text which translated talks about how the dragon clan vanished after a great conflict? Oh the image too big. 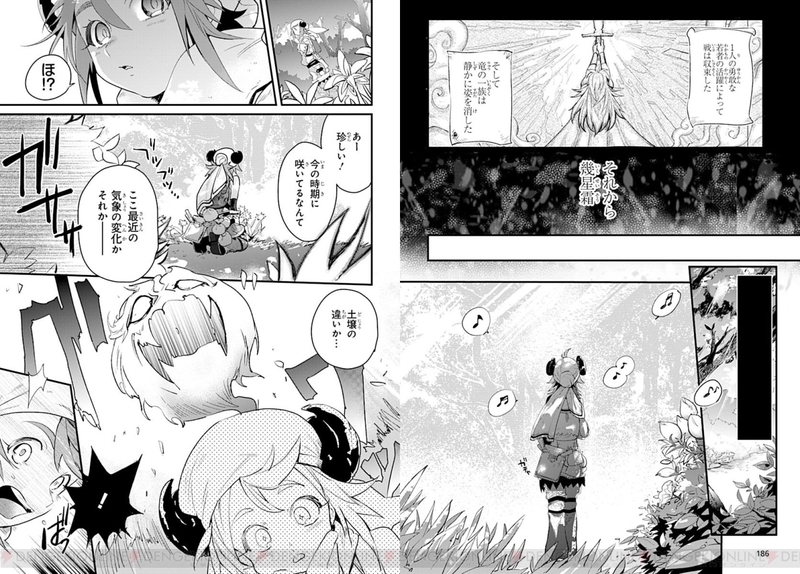 If someone is able to find some scans, I would gladly translate it. Guys.... I think I found the manga first chapter? 3. I'm a big breath of fire fan. 4. I live next door to a convenience store with lots of monthly manga magazines. Even though I find the art style of this sexually gratuitous and generic (I miss you Tatsuya Yoshikawa T.T), I still want to read it. I will try to locate the manga. I've never bought one of the monthly manga books, so I'm not sure how expensive they are. I'll go check it out and update you here. I went to two convenience stores and neither of them had this magazine. They were either sold out, or maybe this is only sold at bookstores. I'll try to head to the bookstore tomorrow. I know I've seen this magazine somewhere, I just don't remember where. About $6 for the manga though, not bad. Also, someone may have already scanned it somewhere online, has anyone looked?